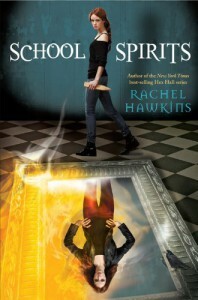 3.5 stars - I was happy with School Spirits but had to round down because I think book 1 of Hex Hall was just a little bit better.If you took the offbeat humor from Hex Hall and incorporated elements from Snow White (talking mirror), Vampire Academy (dreamwalking), and Anna Dressed in Blood (ghost hunting), you'll end up with the peculiar formula for School Spirits.The rest of the day passed uneventfully. I guess after you've beaten someone up with a dodgeball and flirted with a monster, most anything else will seem pretty tame.How did Rachel Hawkins make me picture a young man wearing a cravat and toting an inhaler as a viable love interest? I love that! Quirky is good. Dex is a great character.But let's forget about Dex for a moment. Because my heart truly belongs to Torin, the man in the mirror (cue sappy Michael Jackson song). I don't care that he's 400 years old. I get Torin. It will make me sad if he screws people in the end after he gets out (because I predict he will be getting out of his prison at sometime). Much like Vic, the talking sword in Mythos Academy, Torin brings an extra dash of personality to the story. Except I somehow picture Torin as hot, whereas Vic is just a sword with a creepy eye. HEY, at least people in a mirror can actually look like people. That has to make me seem less crazy, right? Right?What I appreciated the most about School Spirits was that it brought back some of the fun factor that I'd missed since book 1 of Hex Hall. While the former trilogy was solid overall, I felt like the quality had gone slightly downhill toward the end. But the magic is back now, in all its snarky, different glory.Everyone at the Waffle Hut is shady. That's why they go to the Waffle Hut. To...be shady. And eat waffles. Shadily.While I think this series could probably be read without having read Hex Hall first, there will be a few family references and terms which aren't fully explained because I think it's assumed you will know what's going on from having read HH beforehand. So it's really your call where you want to go first. I'd say to start with HH if you haven't already, but if you can't, you'll probably be okay.The writing style of Hawkins is fun, adventurous, snarky, and a little bit fluffy. I'm okay with the steam factor being downplayed because I'll sacrifice some edginess in order to remind myself that I'm actually here for the story. In that department, nothing is lacking. I loved the characters, the new dimension of magic, and the crazy adventures.So here's my thumbs up. I'm looking forward to book 2!This book provided from the publisher through Netgalley in exchange for an honest review. All quotes mentioned are from the pre-release copy and may not be present in the final copy.